سوف نقوم بمراجعة الترجمة ، والتعديل عليها في حال كان الحاجة لذلك وسنقوم بنشره علی الموقع الالكتروني. مساعدتك لنا تجعل من الممكن ان ننشر ترجمة سريعة و بدقة عالية لتحقق هدفنا في التواصل مع جميع المشاركين والمجموعات المهتمة الاخری وخاصة متكلمي العربية. مرة اخری شكرا لك. 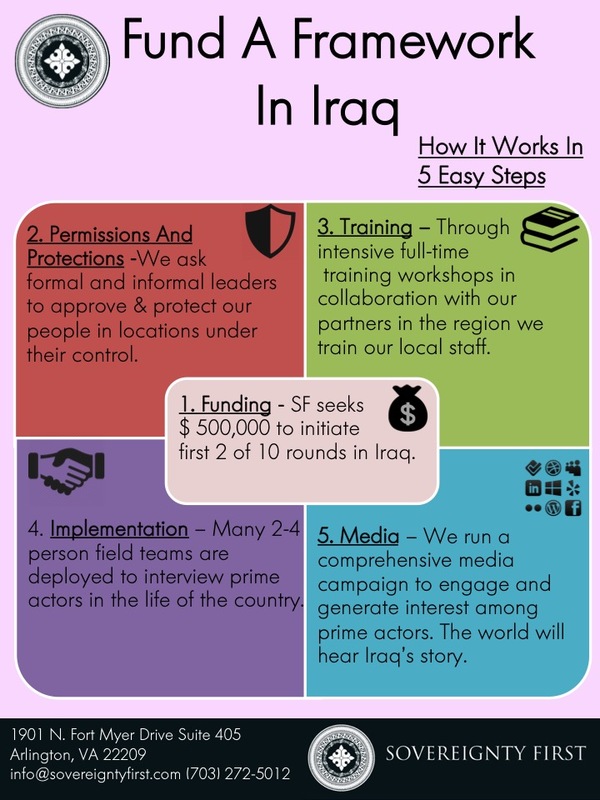 The Sovereignty First Framework in Iraq - We are currently seeking funding to launch the Sovereignty First Framework in Iraq (including Iraqi Kurdistan), working with local, regional, and international actors. Iraq faces not only conventional warfare and terrorism from ISIL but also the repercussions of a largely failed previous reconstruction. It is of paramount importance that the relationship between Baghdad and the semi-autonomous Kurdish region is managed effectively. Addressing these threats and building stability amid conflicting and confused perspectives, damaged and suspicious relationships, and constantly shifting conditions demands a deliberate and structured means of gathering, distributing, and reaching an agreement about information fundamental to the future of the country: what prime actors are influential and why, and the economic, political, social, and cultural capacity of the country to adapt. The Sovereignty First Framework is the only methodology capable of gathering the open-source economic, social, and legal information to enable the relationship-building and baseline understanding actors need to begin the work of creating a peaceful, strong, and healthy Iraq. Click here to learn more. Travel to ensure that all actors have an opportunity to participate. A training and capacity transfer program to prepare Iraqis to take over the project. Implementation of the framework in a way that will enlist perspectives from actors across economic, political, military, social, and cultural spectrums. Sovereignty First has begun building a network of supporters and potential partners for funding, training, implementation, and a media campaign in the Kurdish region of Iraq and is beginning an initiative to build partnerships and infrastructure throughout the rest of the country. The world will hear Iraq's story. Implementing the Sovereignty First framework in Iraq is estimated to cost approximately $10 million per year to implement, with a goal of transferring operations to Iraqis at a time acceptable to both parties. We are currently seeking $500,000 to initiate the framework for Iraq, which will allow us to begin work immediate work in the Kurdish region and soon thereafter to start in the rest of the country. The Kurdish Heritage Institute - We are in discussions with the Kurdish Heritage Institute, which was founded in 2003 by Mazhar Khaleqi, an internationally renowned Kurdish singer and recording artist. The Institute’s purpose is to preserve Kurdish traditional arts, music, and other forms of folklore, promote appreciation of traditional Kurdish arts, and ensure continuation of Kurdish cultural heritage by providing opportunities for people to learn traditional arts. KHI maintains extensive video and audio archives of performance arts, a library of over 5000 volumes (in Kurdish, Arabic, Persian, Turkish, and English), and a state of the art audio and video recording facility. The KHI also publishes print, audio, and video materials about Kurdish folklore and folklife, organizes festivals and exhibits, and presents cultural seminars. The Kurdish Heritage Institute is based in Sulaimaniyah and Dohuk, with additional representation throughout Iraqi Kurdistan. Our network is built of organizations and individuals within Iraq who have expressed their interest in supporting and promoting the Sovereignty First Framework in Iraq in various ways. We look forward to collaborating with them as we implement the Sovereignty First Framework in Iraq.